Advanced Care for Hips and Joints! Formulated to provide all dogs in need of advanced joint care such a senior pets, large breeds, active sporting dogs and those recovering from joint related surgery. Synergistic formula includes Glucosamine, Chondroitin Sulfate, Ester-C, MSM and Hyaluronic Acid to provide the most comprehensive hip & joint care on the market today. 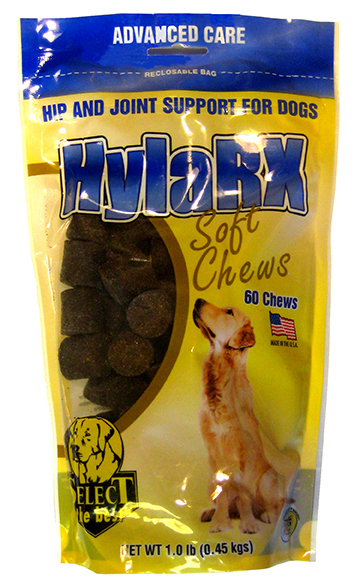 HylaRX Soft Chews for Dogs is a tasty chicken flavored product that is easy to administer and will have your favorite pet asking for more! What's even better is HylaRX Soft Chews for Dogs is made right here in the USA from the highest quality of ingredients and manufacturing process to give you the peace of mind that you are Selecting The Best!